Cite Them Right Online answers the question “How do I reference this?” You can pick a type of source and see how to reference it. 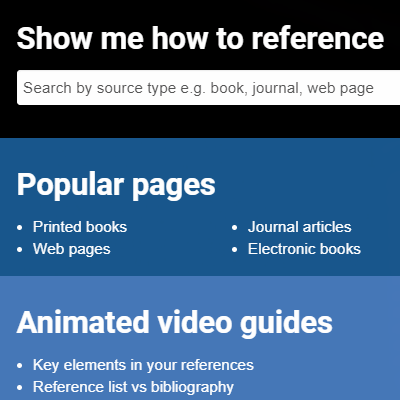 Books, articles, reports, BlackBoard materials, films, legal stuff, images, discussion forums, games: use Cite Them Right Online to reference sources your short guide doesn’t cover. It has all the referencing basics, including in-text citations, secondary referencing and the differences between quoting, paraphrasing and summarising. It focuses on Harvard, but also has drop-down options for APA, MHRA, OSCOLA and Vancouver. It won’t store your references for you, or do your references for you. It provides extra support and advice beyond the short guide Library Services provide. It is not the definitive guide for non-Harvard styles. For the official guidance for MHRA, OSCOLA or APA, see the links provided on the referencing page.